Patrick Bamford, who is set to be a key player if Leeds United are to finish in the top two. 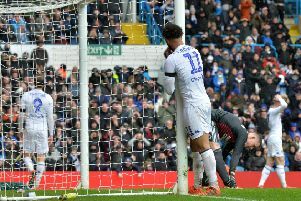 No matter how unlucky defeat was in the Yorkshire derby with Sheffield United at Elland Road it has had a pivotal effect in the race for the Premier. Suddenly from being two points ahead of the Blades, Marcelo Bielsa’s men are one behind and with a significantly worse goal difference. Even if they were to win all eight of their remaining Sky Bet Championship fixtures it does not guarantee a top two spot for the Whites if their rivals from South Yorkshire also achieve the same feat. Leeds also find themselves five points behind leaders Norwich who are showing no signs of blowing up and have a favourable run-in so the importance of that single goal loss to the Blades cannot be underestimated for the damage it has caused. A look at the teams still to play for all three of the promotion rivals will not fill supporters with any greater confidence either that there will be any easy way back into the top two for the Whites. Neither Leeds nor Sheffield have a side in the current top five still to play and both have to take on the same four teams with trips to Preston for each of the Yorkshire clubs along with home matches against Millwall and away dates at Birmingham City. The Whites face bottom of the table Ipswich away (last game of the season) while the Blades are at home to the East Anglian side in their penultimate contest. Leeds’ other four remaining games include potentially tricky home matches with resurgent clubs Sheffield Wednesday and Aston Villa who are pushing hard for a play-off place, an away day at mid-table Brentford and an Elland Road date with a Wigan Athletic team battling to avoid relegation. The Blades, meanwhile, who have remarkably gone seven games without conceding a goal, finish their campaign at Stoke City and will also fancy their chances of bringing home the points from a trip to Hull City. But they do face play-off contenders in two matches at Bramall Lane with Bristol City and Nottingham Forest their opponents. Norwich have also none of the top four to meet, although they do play a desperate fifth-placed Middlesbrough side next up at the Riverside. They then host QPR and Reading and will be confident of six points from these two fixtures before another bottom six side Wigan are their opponents in an away fixture. Trickier matches against Sheffield Wednesday and Aston Villa follow, but the Canaries’ other opponents, Stoke and Blackburn, are likely to have little to play for. On the face of it then, short of a shock collapse it does look hard for either of the Uniteds to reel Norwich in.